Hi, my Acer Palmatum, has an ugly 5mm dia root/nebari, which loops up above the soil. Can i wire it straight or should i cut it off ? If i cut it will the tree die off ? And would i need to seal the cut ? Maples are very tollerant of having thier roots pruned - especially at this time of year. I would however advise you to trim it off when you next repot the tree so you can get it off close to the trunk and seal it up nicely - or place it more favourably. oh i see it better now. maybe put a stone on it to flatten it a little ? , If i cut a wedge underneath the ugly root,so it could be bent down under the surface,would the cut need sealing ? The bud,s are swelling on my 2 acers, 1 is in a very small pot,should i make the root cut & repot now,before the buds open ? I want to thicken the trunks,but don,t have a garden. Does the tapping the trunk, causing it to swell method work effectively, or how about using a torniquet above the roots ? here is what my buds looked like when i repotted and root pruned. apologies for the image quality. this is the tree. early in its development still. Here is the tree today. It appears to not have noticed the repot and pruning. This about 1 month after repotting. I suppose im old fashioned - but i let my trunks thicken naturally. I've not grown them in growing beds or used any technique to thicken them. I just try to get lots of leaves and branches - as the trunk thickness naturally is the sum of all the branches that feed into it - as per leonardo da vinci's observations. I'm 99% sure than if you cut that root off and didnt seal it you wouldnt come to any harm. but i see a large lateral root like that as an asset to try to preserve most of it. At the early stage of development you dont really need to prune the roots - just put it into a bigger pot with good soil around the old root system and maybe remove a few outer roots if they are compacted against the side of the origional pot. The theory is that as the buds are swelling the stored winter engery in the roots has moved up into the trunk and leaves and that it is the right time to trim the roots if needed. i blog a bit about my trees. mostly for myself as a journal and for the odd passer by. please dont flame me. Da Vinci's study is a great model, however it is not totally applicable to bonsai per se. It is not just a cross sectional area correlation rather a moment stress that a certain section of the tree has to carry. All the loads, weight (branch, leaves, flowers, fruits) , wind, snow, etc. have to be factored in. Unlike regular force or load...distance plays a big factor (a multiplier if you will). Try holding a 20lb dumbbell by your body...now extend your arm straight out. Same weight but your should feel a lot more strain. Same with trees. The closer you get to the roots system....the thicker the trunk/branch should be. Regarding wind load...there are also different means how a tree respond. Some fight it by building stronger trunk and branches, others go and sway with it thus not needing much bulk. This explains literati, bamboo, windswept styles, etc. to some degree. I guess what I am saying is that bonsai is an exaggerated version that mimic natural trees. If you use his formula, you won't have the desirable taper needed to get a good bonsai and it cannot be attained expediently by just letting nature take its course without your (or other outside forces) regular interference...because it doesn't experience the same moment of force (being a miniature). 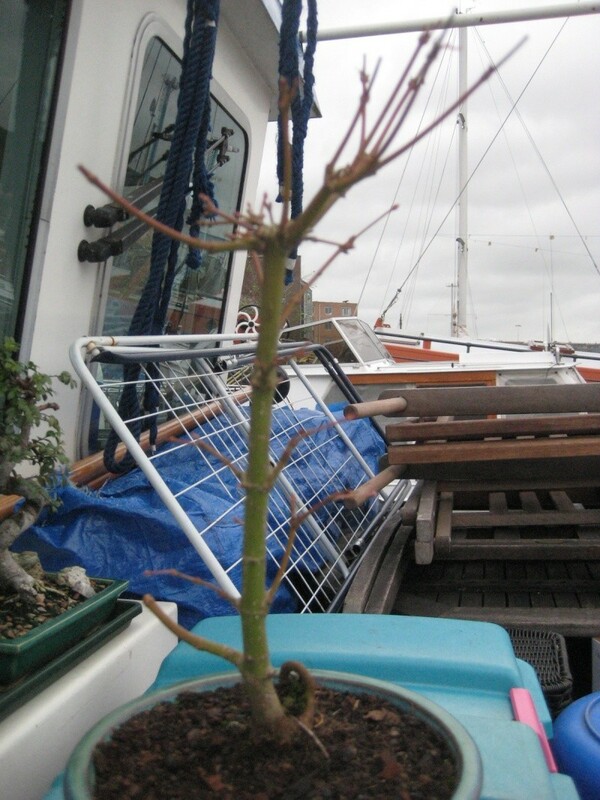 Hi Barge, as your maple grows branches and roots will develop that are too large and these must be cut back to allow smaller branches and roots that fit the size of the tree. This overgrown root should be removed to allow smaller roots to develop that will give you a balanced nebari all the way around the base instead of all one sided. Cutting it will cause roots to develop on the other side to develop and you have to watch them and prune out any that overreact to the stimulus, one always wants to be the leader of the pack, so at each repotting the roots need to be rebalanced to create a nice even spread. watch out for cross-over roots, too, and either rearrange or remove them. The root shown will only get bigger and bigger as the tree grows so you need to address it now. Another option with a root like this is to cut it shorter and then split it with a sharp knife and then spread the two apart. Finer roots will grow from the two pieces. While it is regrowing the roots on the other side will begin to grow better, too, and a better nebari will result. This is a constant on-going cycle with roots and branches, they get big, you cut them back. Paul, the bud pic is just the perfect visual way for newbie,s to learn. Nice tree paul,I see a red maple in the pic,could you post that up. My Acer is an Orange Dream cultivar, hope it turns out as good as your tree. I,m going to follow your idea Katzin,of pruning the big root, & splitting it. Here is the red one. Its variety is Deshojo. Its very early in its training - but still pretty to me. Once its sping foliage display is over im going to give it some serious work. 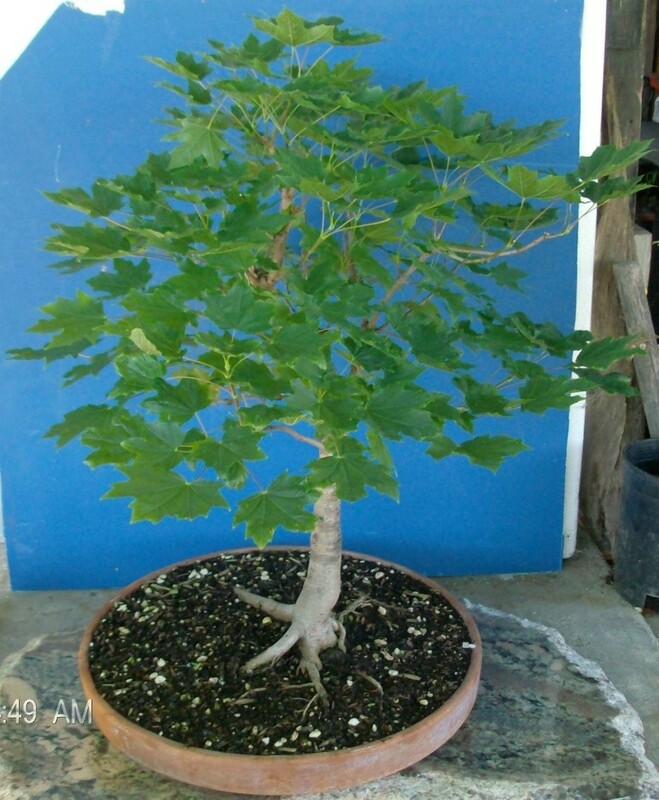 I have some great articles in some old bonsai focus magazines about repotting maples. Not sure how i can legally share them here though. The big green maple is now 5 years old. Its whole life has been in pots. Hi barge, here is one of my maples that needs root work. This is in 2009 and you can see the oversized roots that need to be addressed. I planted the tree in open ground in 2010 to give it a couple of years of free growing and this season I'm going to dig it up and fix these roots. You may not need to go to that extreme if you have a good root mass to work with, but this tree came to me in a sack after being rudely extracted from the ground with a spade without much care for conserving roots, a testament to the hardiness of these trees, as far as being able to stand up to a carefully done root job. This tree has been my mentor in many of the techniques needed to grow maples in general and gave me the confidence to work with some of the more favorable Japanese Maples. I'll take some pics of the operation when I do it.